Back in July, I suggested that Google+ lacked the features that would allow it to displace Facebook. While Google+ was technologically wonderful, I argued, it did not solve a problem for consumers and therefore would not attract users. Despite the reported 50 million people who have signed up for the service, it’s not clear how many are regularly using it. And, of course, it is use that matters. While it is still too early to tell if Google+ has completely lost the opportunity to build a virtuous cycle of adoption and greater use, we can assess the one feature of Google+ that distinguished it from Facebook: “circles.” That feature, and Facebook’s response to it, helps us understand how Facebook “gets social” and the broader implications for both businesses. 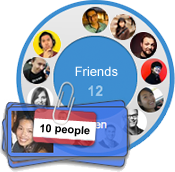 When you first sign up to Google+ it asks you to spend time sorting people you know into circles. This handy advertisement shoes exactly how circles work. It’s a simple interface, but it takes some time to do the sorting. You need to envisage what groups of people you might want to share information with and then structure circles accordingly. Figuring out which circles match the kind of sharing you anticipate doing in the future can be complicated and time consuming. Because the issue of “who to share with” is a real one, and one that Google offered a solution for, Facebook was quick to replicate circles’ essential elements. As a result, when you now post to Facebook, you can elect who to share the information with. To be sure, and this is critical, it is a distinct solution from circles. Facebook’s default is that you’ll share information with all of your friends. This is the promise when you friend someone on Facebook: that by your mutual agreement, you will share stuff with each other. But the new functionality allows you, for a specific post, to choose to limit that sharing (or, indeed, expand it to the public). But should I decide that a particular video (say, this amusing one about Siri) is not something I want to share with my 13 year old daughter, I can restrict it to certain friends. The Facebook solution requires you to worry and work on sharing settings for each post, while Google lowers that cost by moving the decisions to sign-up. But critically, the Facebook default encourages you not to limit sharing. Indeed, you’ll share the vast majority of information on Facebook with all of your friends. On Google, you’ll likely exercise your limited sharing options, thinking about which circle to share each post with as you go. The upshot of this is, on the whole, Google has incentives to reduce the amount of sharing going on while Facebook seeks to set defaults to maximize it. This is why sometimes people claim that Facebook “gets social” and Google does not. This distinction has a critical impact on each company’s business. The network effects by which users value a particular network increase based on the amount of sharing going on. One telephone is useless. But with many millions and a phone book, you’re getting somewhere. Facebook’s defaults nudge people towards sharing while Google’s do not. Indeed, Google’s entire attraction is its sales pitch, “Suppose you don’t want to share something with all your friends, we make that easy.” So it attracts users more inclined to limit sharing. Here’s the business implication: in the end, sharing is how social networks will make money and Facebook has positioned itself to maximize both. I see very little difference in how Google and Facebook induce or limit sharing of posts. Both have sharing defaults. Both allow you to change the settings of a specific post fairly easily. The sharing models are nearly identical now with only slight presentation differences. Your earlier article was dead on that Google+ is hampered by network effects of slow adoption and lacking that adoption because it does not provide much difference over the Facebook social experience. Google+ (and all the other similar social services) are coming from behind on Network growth. Their success will depend on how they can draw users to the network. It will not be by bragging about “You can post stuff others can read”, but by finding ways to smoothly integrate the service into the online lives of their users (without losing too many from the same integration). Facebook default privacy for posts starts off as friends but subsequently it is set to that used for the last post. If the last post was public that is the default for the next one so you need to be on your toes. Ah. OK. That means that Facebook and Google+ are the same in that respect also.